To borrow something I repeated in the Easing Functions in CSS tutorial, one of the most important things you can do is introduce your animations to easing functions. Notice that this animation doesn't exhibit the boringness of the first animation. The animated circle starts off slow, speeds up in the middle, and slows down towards the end. All of this is made possible thanks to easing functions. Over a very short period of time, Robert's library of easing functions became very popular. That was true then. It is still true today. His easing functions have been included into popular libraries, converted into various programming languages, and possibly inspired quite a few hit songs. It's hard to talk about easing functions in code without relying on his initial work, so the easing functions you will learn to add in this tutorial are 100% grown by him. 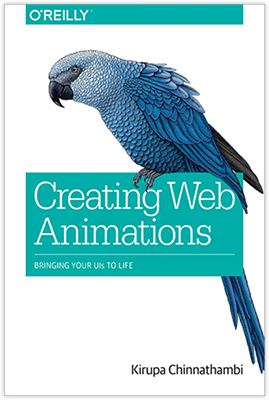 This will not only ensure you are being consistent with what everybody is familiar with, it will allow you to focus on what actually matters - creating high quality animations without reinventing the wheel. In order to use Robert's easing functions, we need to setup our animation in a certain way where his easing functions can be used "out of the box" without any modification required. This isn't as intrusive as it sounds, so let's look at what these changes involve at a very high level before going deeper into the changes themselves. Everything else from your requestAnimationFrame call to assigning a value to the property you are animating will stay the same. 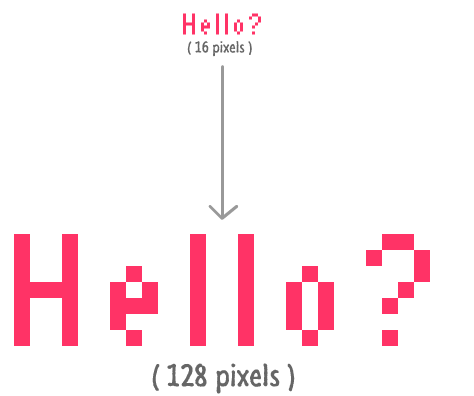 Despite how limited the code changes are, conceptually you will need to think about your animation in more detail than what we've done in the past. These details are important, and the following sections will drive home both the code as well as the conceptual changes. One of the major changes in how we think about animations in code revolves around how time is represented. 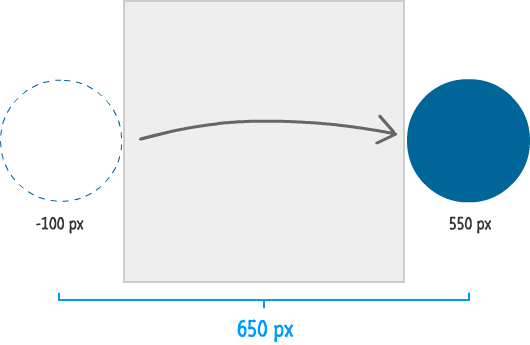 When you are animating in CSS, the way you define duration in an animation or transition is in the form of seconds. How those seconds translate into the animation you see on the screen is abstracted away and hidden. Good for them. Now, calling each time our animation loop changes 1/60th of a second seems a bit awkward. We need a new name for each time our animation loop gets called. While the word "frame" seems like an obvious choice, let's go a bit more generic and use the word, iteration. 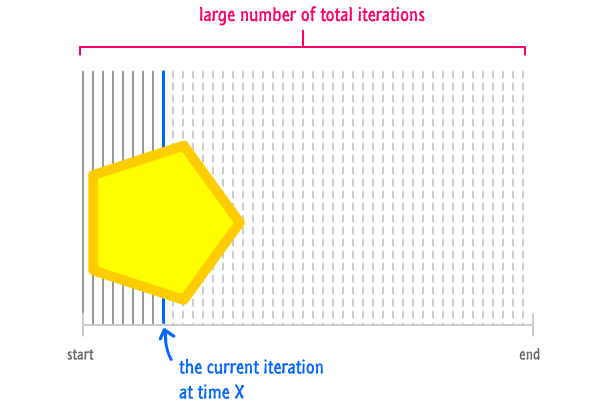 There are two types of iterations you need to be aware of that will simplify things further - current iteration and total iterations. We'll look at both of these next. The value our current iteration stores is simply a count of how many iterations (aka how many times our animation loop has been called) have elapsed since the animation started. Now, all animations have a point where they end or reach a temporary "end" before looping or doing something else. When that point occurs is determined by the total number of iterations your animation will have, and this number maps to what once used to be our duration. As you saw earlier, to convert from duration to iterations, multiply your duration value by the animation's frame rate of 60. If your animation is 5 seconds long, that means your animation will run for 300 iterations. If your animation is .2 seconds long, it means your animation will run for 12 iterations. The larger this total iterations value, the longer it will take your animation to complete. The smaller this value, the quicker your animation will complete. While that makes sense for durations, let me elaborate a bit on why that is the case when dealing with iterations. Remember, the rate at which you progress through each iteration doesn't change. No matter how large or small the total number of iterations your animation has, your animation will progress at sixty iterations each second. 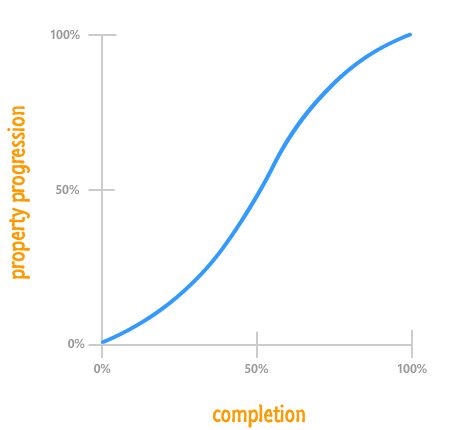 This means, the more iterations you have, the longer it will take your animation to get there. It's kinda like adding more miles to a trip when your car will only go at 60 mph. You have more distance to cover, and since your car can't go any faster, you just end up driving (or sitting in the passenger seat) longer to compensate for the extra distance. Your animation still barrels ahead at sixty iterations a second, but you just don't have as far to barrel through as you did earlier when you had a lot of iterations. That's it for our look at the no-longer-mysterious iteration values. You'll see them crop up shortly when we look at how all of these changes fit together. For the way Robert Penner's easing functions work, you need to know one more piece extremely easy-to-find piece of information. You need to know how much the animated value changed from the beginning to the end. In our example, subtracting the final value of 500 from our initial value of -100 gives you 600. What this change in value signifies is that our shape traveled by 600 pixels from beginning to end to reach its destination. This is a small detail for us to figure out, but it is a giant leap for getting easing functions to work. The duration value has been replaced with current iteration and total iterations. We've added in change in value to symbolize the difference between the final value and the starting value. You'll see why in just a few moments. If you glance through that file, you'll see a lot of easing functions defined. A lot of what you see will seem like some complicated mathematical expressions...which they are! The thing I want you to note are the arguments each function takes. Do these arguments look familiar? They should! They map directly to the changes we discussed at length in the previous section. What these easing functions define is the mathematical form of the timing curves you saw at length in my Easing Functions in CSS3 tutorial. So far, we've looked at our easing functions in isolation and in a very disconnected-from-reality point of view. 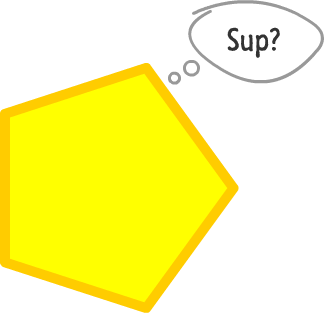 I haven't concretely explained how all of this would look in a real animation. Let's fix that now in preparation for applying everything you've learned into a real example. Next up is filling in the values for currentIteration and totalIterations. We'll start with totalIterations first and then cover the slightly more complicated currentIteration argument. The currentIteration argument isn't as easy to set as the three other arguments you've seen so far, but it isn't complicated either. You'll have to write a few lines of code to have it make sense. Remember, your currentIteration value is a count of how many times your animation loop (the animate function in our case) has been called. Notice that I declared a variable called iterationCount, and this variable is what gets passed in to our easeOutCubic easing function as well as what gets incremented by one each time. This is all it takes for your animation to now run. See, the ratio between iterationCount and totalIterations ranges between 0 (the very beginning) and 1 (the very end). The value that gets returned by your easing function uses the ratio between iterationCount and totalIterations as a way of measuring progress. Based on that, the value your easing function returns falls between your start value and your final value (startValue + changeInValue). There are a few more things that are worth calling out such as looping and alternating once your animation hits the end, but we'll cover them as part of looking at a real example. Using an Easing Function (for Real)! The circle's horizontal position starts off at -100 pixels and ends at 550 pixels. To put differently, the total change in how far our circle traveled is 650 pixels. While you can't see from the image, the circle makes this journey in around 3 seconds. Anyway, let's get to making the changes to make our circle slide from left to right. This ensures that your document has access to all of the easing functions that you will want to use. Your iteration variable will increment by one each time your drawCircle function is called. As you saw earlier, the totalIterations value is what is used to determine your animation's duration. Our value of 200 will ensure our animation runs for just a little over 3 seconds. With the iteration and totalIterations variables setup, it's time to bring in our guest of honor - the easing function. Our goal is to have our circle slide horizontally from left to right, and this means we animate the value that specifies our circle's horizontal position. More specifically, inside this line, it is the first 225 you see that corresponds to where horizontally the circle is drawn. It is this value that our easing function needs to alter in each iteration. Notice that our easingValue variable is set to whatever gets returned by our easeInOutExpo function. Our good friends iteration and totalIterations have already made themselves at home. The start value is set to -100 and the total change in this value is going to be 650. The most important step, besides adding your easing function, is having your easing function actually help out with the animation. Right now, our easingValue variable is storing the appropriate value for whatever iteration you are currently in. The problem is that this value isn't affecting our circle's horizontal position value - the very value we are hoping to animate. 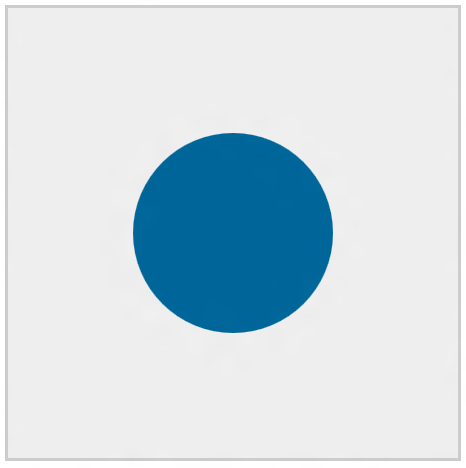 Once you have done this, if you preview your document now, you will see the blue circle happily sliding from the left side of the canvas element to the right hand side. There is one problem here, though. The circle only animates once. We'll address that next. When your currentIteration value catches up to totalIterations, your animation is considered to have run to completion. It is done and the property you are animating has reached its final value. If you meant for your animation to only run once, there is nothing more for you to do here. You may want to do some minor cleanup to avoid having your requestAnimationFrame function do something unnecessary, but overall you can congratulate yourself on a job well done. There will be many cases where you would want to do something different than just doing nothing. We'll look at two cases of what this "something different" may look like. One case will be restarting your animation from the beginning just like the example you saw at the very beginning of this tutorial. Another case will be alternating your animation's direction. 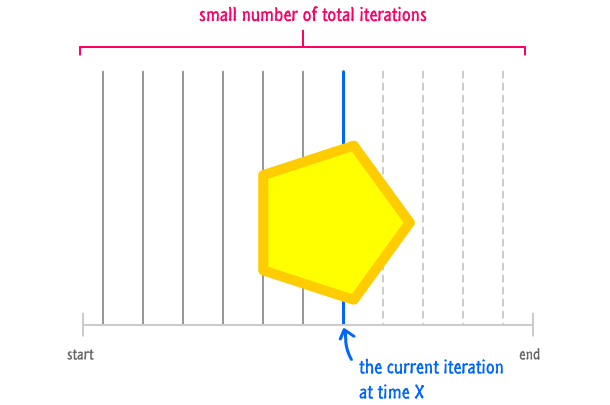 Because our iteration variable determines your animation's progress, to restart the animation, all we need to do is reset the iteration variable's value to 0 once its value reaches the value stored by totalIterations. At all other times, when the animation is still in progress, the iteration variable should increment like it normally would. If you preview your animation now, you'll see your circle sliding in. Then you'll see it repeat again...and again...and again. If restarting your animation seems boring, another thing you can do is alternating the direction your animation runs each time it reaches the end. This is slightly more involved in that you need to determine the direction to go in and specify the appropriate arguments into your easing function to actually make the direction change happen. With that said, the end result is totally worth it. The changes should be pretty straightforward once you understand that the moveRight boolean value is used as an indicator to let your animation to know which direction to run in. Instead of using the same easeInOutExpo function, I decided to use the easeInExpo function instead. This change in easing functions is not what caused the direction to change, though. The direction change is made possible because of the new values for the startingValue and changeInValue arguments. Robert's easing functions aren't designed to be a replacement for your own easing equations either. If you have your own way of creating something that users are happy with, by all means, run with it and possibly even share your approach with the rest of the world. A lot of the animations I create are the oscillations that are simpler to do one my own without using predefined functions. If you don't have your own way of working with easing functions, the approach I outlined here is a great path to take...if I do say so myself!